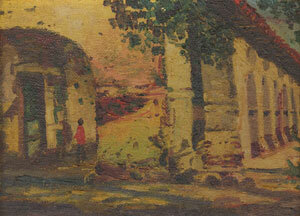 E. A. Burbank, Pog-Ah-Ninnie-Ah-Ey (Santa Clara), 1909, Conte Crayon on Paper, 14" x 9"
E. A. Burbank, Mission San Juan Capistrano of California, Circa 1895-1900, Oil on Canvas on Board, 4" x 6"
After the completion of the Northwest project, E. A. Burbank went to Munich to study, where he met J.H. Sharp and William R. Leigh, who would remain lifelong friends. As did countless other artists who met Sharp, E. A. Burbank became focused on traveling and painting the Indian people of the Southwest. When he returned from Germany, he was hired by his uncle, Edward Ayer, the first president of the Field Columbian Museum, to paint portraits of the great Indian leaders of the day. 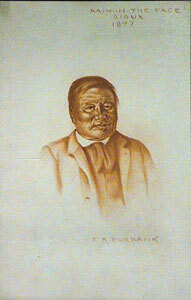 Elbridge A. Burbank took on the project and, once completed, did not stop, continuously traveling around the country painting as many Indian subjects as he could. 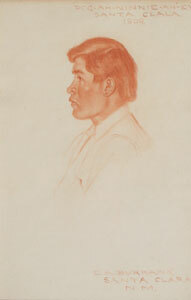 E. A. Burbank, Rain in the Face Sioux - 1897 Conte Crayon on Paper, 14" x 9"
All told, E. A. Burbank painted over 1200 Indian portraits in his lifetime. His travels put him in contact with some of the prominent figures of the West, including Lorenzo Hubbell, who he counted amongst his better friends, and Geronimo, whose portrait he painted and who is rumored to have said that he liked Burbank better than any other white man he ever met. Today, E. A. Burbank's work can be seen in the collections of the Newberry Library in Chicago, the Smithsonian and the Field Museum. After almost twenty years spent in insane asylums, Elbridge Ayer Burbank died in 1949 of injuries sustained from being struck by a cable car in downtown San Francisco. 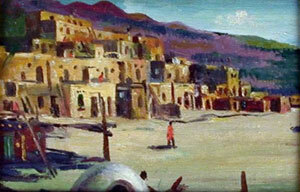 E. A. Burbank, Taos Indian Village, Oil on Canvas on Board, 4" x 6"